Carrying on from where I left off with printed pencil skirts, I thought I'd do a little edit of printed trousers, or keks as we call them in Liverpool. This look is much easier to wear than you'd think - just add a plain t-shirt and a blazer, and a pair of heels. Again, I was a bit beaten on this task by a plague of polyester, so I have included a couple which are made out of the stuff. Although I have to say that Topshop, who have by far the best selection, have made all of theirs from cotton. Well done Topshop. 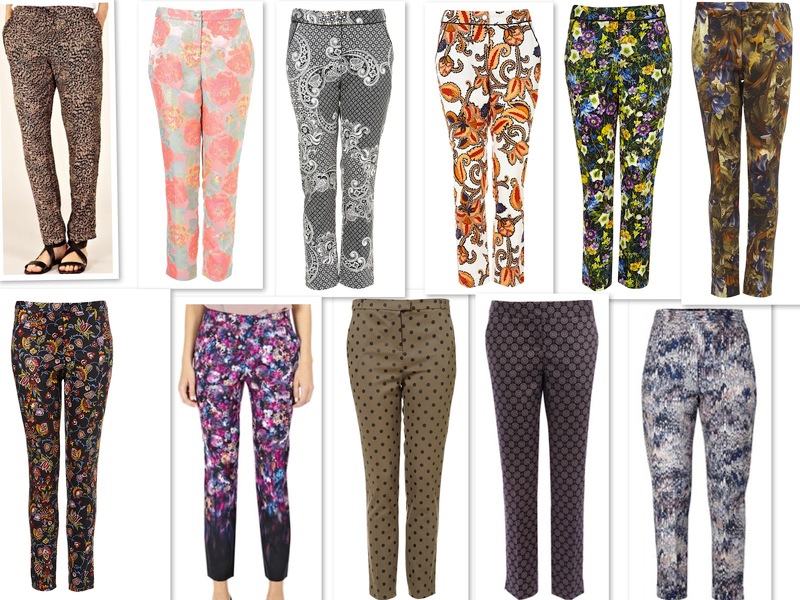 Leopard print trousers, £35 Oasis; floral jacquard trousers, £50 Topshop; Paisely cigarette trousers, £35 Topshop; Paisely print cigarette trousers, £35 Topshop; floral print cigarette trousers, £35 Topshop; jungle floral skinny trousers, £40 Topshop. Co-ord Tapestry trousers, £40 Topshop; floral print trouser, £50 Warehouse; khaki flock spot trousers, £38 Topshop; tile print trousers, £48 Warehouse; sub zero slim fit trouser, £82 French Connection.